you must answer that call. it was time to get my noodle on! wave my noodle around in pride? I have to admit, I did try a different noodle approach at first. I wanted to attempt to go where no noodle had gone before. and adorn it with assorted pool related accents? Yeah that plan did not work at all! I quickly found that a layer of clothing, if you will, was the way to go. My fair noodle awaits, so let's go on with it! yellow polka dot bikini fabric. hydrangeas came in summer brights anyway! I think I'm going to hang this wreath on my back door. She is kinda cute, after all. are you joining in on noodle madness? 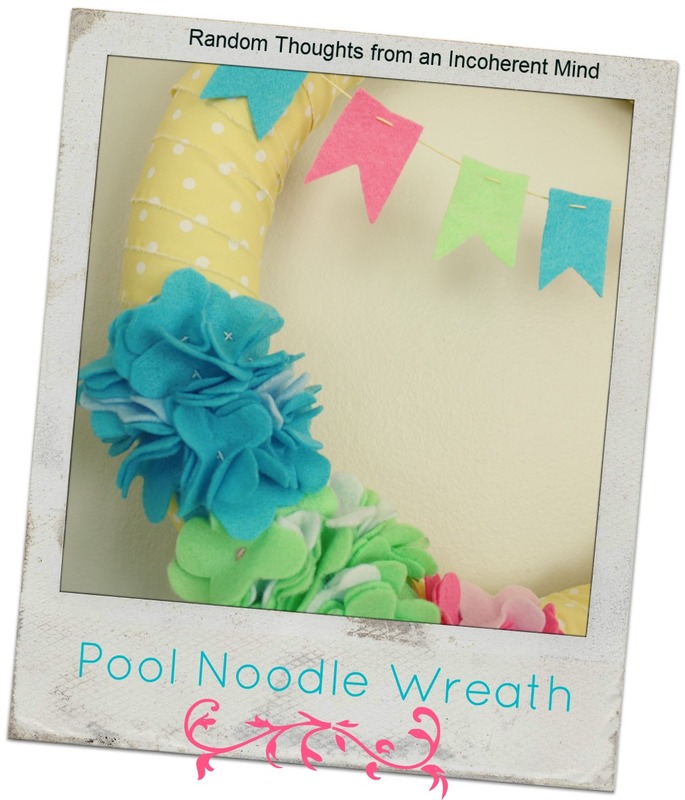 Pool Noodle Blog Hop Party. Gina it's Sooooo cute though. The color combo is so playful and FUN. I went "wreath" too. My knee and Cali trip sidelined my more creative idea ;) Maybe later? Gina! It's gorgeous! I love the yellow, and the flowers are fabulous! Thank you so much for sharing! 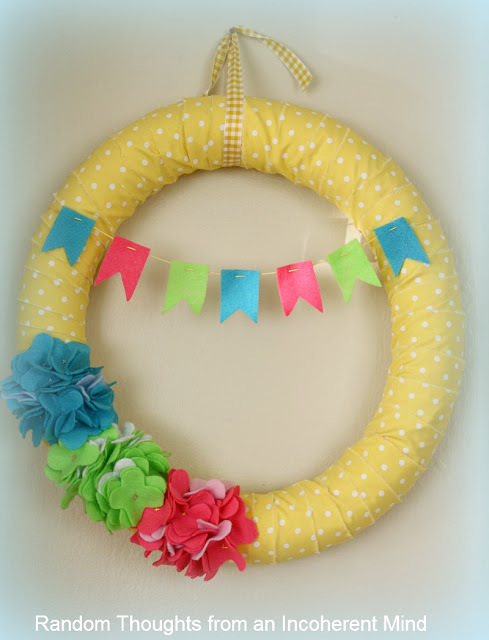 Gina your noodle wreath is adorable....it just makes me smile!! Love your noodle wreath! So bright and colorful. Perfect for summer! Love you yellow polka dots Gina! How cute! Love the flowers too, nice touch. This was so much fun! Although not sure what my husband thinks of the noodle, he keeps looking at it strangely every time he opens the door! Gina, I love it! So cute, the colors are awesome! Oh my goodness, Gina! This is just so cute! I love the pennant! Your wreath came out exactly how I new it would...VERY CUTE! Love the color palette! I am loving your yellow polka dottie fabric on that. It says SUMMER all over the place. Love it! That is so adorable, Gina! 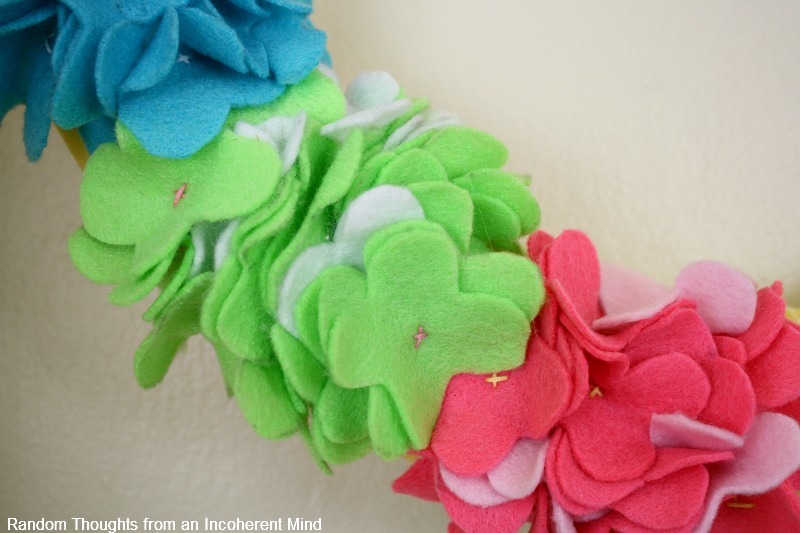 I love your felt hydrangeas! Such a cute noodle wreath. Perfect summertime colors. Gina, this is the cutest thing I have ever seen....I love the colors, too!!!! So cute! I love the hydrangeas and the bikini style fabric. Cute post! You made me laugh this morning! ha! 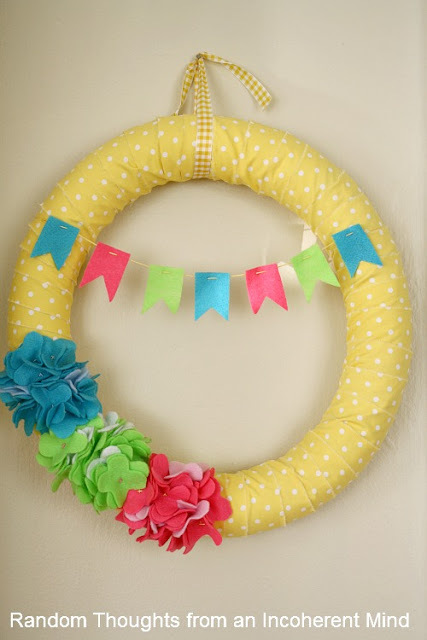 And the wreath is just the cutest creation ever!!! Love the little banner and the pretty flowers! I just love this idea of making a wreath out of a pool noodle. So creative! Gina that is so pretty, love those colorful hydrangeas. I'm going to use my extra noodles to make wreaths too. So much summer fun with a pool noodle- Who knew a noodle could be so cute on a door? Yours is fabulous! So very cute Gina. I see those noodles at the dollar store all the time. What a great idea. That is so cute! It screams summer! Okay, Miss Gina, your noodle is just one of a kind!! I need to find a noodle and make this. My wreath is losing its flowers. hehehe I need something new for the front porch. Yours looks great. Gina, This turned out sooo cute! The flowers are wonderful.